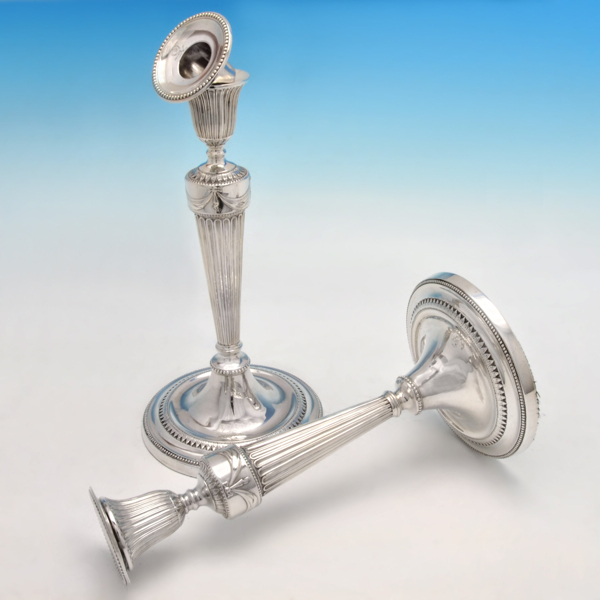 I. Franks Antique Silver: In the Library With a Candlestick? Even if it turns out not to be true, there is no denying most of us tend to spend a lot more time indoors during these dark and dreary months. As a result we search for things to occupy ourselves and, when all other forms of entertainment have been exhausted, bring on the games. Board games have been around for millenia. The first one was probably a game called Senet and examples were found among artifacts in ancient Egyptian burial sites from around 3500 BC. Evidence of early board games have been discovered in many cultures from Iran and Greece to Italy. Most involved boards with grids and various pieces to move as well as some form of dice. The first commercial boardgame is thought to have come from Italy around 1500. It is called Gioco dell’Oca (Game of the Goose) and is still being produced today. Apparently it has always been in production, albeit occasionally re- branded and altered, but with the basic principals remaining the same. Take that Monopoly! And, on that subject, the game of Monopoly was invented by Elizabeth Magie Phillips and was created as an educational tool to help explain taxes and private land monopolies, She took out a patent in 1904 and she self published ‘The Landlord’s Game’ in 1906. Eventually, in the 1930s a version was bought by Parker Bros and the Monopoly we know today,was born. Today's Monopoly is available in dozens of variations. The original game used Atlantic City as its model but now many modern cities have their own adaptations. Here in London we have our own version which I have witnessed being used to base a themed pub crawl on, with people in fancy dress attempting to visit pubs on every stop on the London board. That must take as long as the actual board game used to seem to take when I was little. sneak those notes from under the banker’s noses now? Draughts, played by everyone from Queen Hatasu in ancient Egypt to my Grandad in modern Canada. A gilt and silver plate version above, available from our shop. In 1938 the world was presented with Scrabble. This game was known to keep my mother and her friends up to the wee small hours. She even pulled an all nighter once, I recall. My board looks much the same as my mother's did and really only the words in the dictionary have evolved. Evolved scores a letter score of 14 by the way. A game called Murder came to us in 1944 and was soon renamed Clue or Cluedo. This game created by an English musician by the name of Anthony Pratt and was originally devised as a game to offer distraction in bomb and air raid shelters. It was bought by Waddington and then not officially launched until 1949, owing to post war shortages. The object was to work out which character murdered whom and where, with what. I used to love the tiny figures; the wrench, the dagger, the lead pipe, the revolver, the rope and, of course, the candlestick. I always wanted it to be the candlestick. 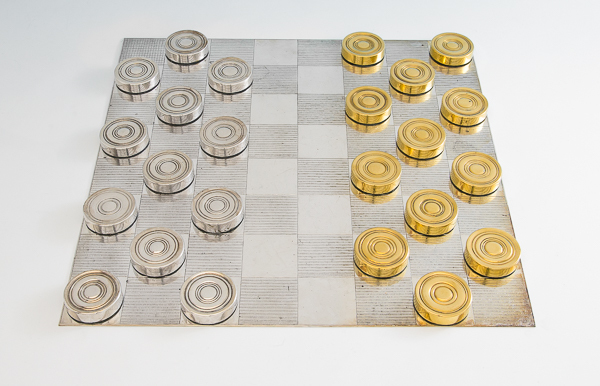 Special editions of this game over the years have seen these pieces in brass or gold plated and ,of course, sterling silver. Why not. The great fun of board games is their endurance. That I am playing the same games that my grandparents played is quite remarkable. And, when my own grandchildren are old enough, I'm sure we will indulge in a bit of post Christmas dinner boardgaming ourselves. Let the games begin, I say.